Government of Canada bond yields have recently hit (modern) record lows. This is the "pain trade" for most Canadian asset allocators, as this is magnifying their actuarial liabilities, while the consensus underweight of bonds is hurting performance. The outperformance of Canadian bonds also flies in the face of the common wisdom that a collapsing currency is bad for bond markets and somehow limits policy options. Despite the alleged panic of Canadian consumers about the high price of food, the impact of the weaker dollar has been relatively modest (unless you crave cauliflower). [UPDATE 2016-01-20] The Bank of Canada kept rates on hold today, which apparently surprised some people (the Canadian dollar strengthened on the news). At this point, the BoC has luxury of waiting to see what will happen, and so I do not think they will do anything until there is some decisive hard economic data that justifies further cuts. The Canadian economy has been diverging somewhat from trends across the border, but the Canadian outlook would darken even further if the United States economy falls into recession. The decision by the Fed to hike rates now looks even more questionable than it appeared at the time. They hiked rates on the premise that there was a danger of the economy overheating "soon," and that the ongoing meltdown in the commodity markets would have no negative impact on the U.S. economy. All the FOMC can do now is pretend that everything is hunky dory, even though risk markets are now getting smashed on an almost daily basis. They cannot hint of a potential policy ease to counteract these strains, as that would confirm that they had no idea what they were doing when they raised rates just a month ago. This paralysis south of the border is not going to be helpful for already shaky Canadian business confidence. Currency Moves - So What? The Canadian dollar hit a value of $0.98 in 2013 (that is, 1 USD = 0.98 CAD, or a Canadian dollar is worth more than a U.S. dollar), dropping to $1.4541 on Friday. This is a loss of 32% of purchasing power over a couple of years. Admittedly, it has been an orderly bear market; emerging market currencies can lose a lot more value in very short periods. However, that is still an impressive sell off. I commonly run across arguments that currency markets can somehow limit policy action (other than for the United States, which is allegedly special because of "reserve currency" status). Supposedly, international bond vigilantes will drive up bond yields as they need to protect the value of their holdings (in foreign currency terms). There are no signs of this whatsoever. Canadian bond yields are plumbing new lows, and Canadian central bankers are dropping hints about rate cuts (to negative levels). The reason why policy action is not constrained is that the effect on the domestic price level of currency movements are mild. There are a few pockets of price increases, but the broad price level is driven by domestic wages. Other than a few exceptional cases (hockey players,...), workers are paid in Canadian dollars, and so the price level shows considerable inertia. I discuss this further below. Arguably, the weakness of the Canadian dollar does allow the Bank of Canada to hold off on rate cuts. This is helpful, given the proximity of the zero bound. Until some major players reduce their oil production, very little can help the Albertan economy. However, the bulk of the population (including yours truly) live in the provinces of Ontario and Québec, and the weaker Canadian dollar is extremely helpful for the prospects of manufacturing exporters -- assuming that our main sources of import demand avoid recession. Correspondingly, policymakers at the Bank of Canada are in a much better position than their American counterparts. They did not hike rates in the face of the global commodity meltdown, and they are getting an easing of "financial conditions" via a weaker currency. They just need to drop hints about negative rates every so often to keep the Canadian dollar on its back foot. Canadians Panicking About Cauliflower Prices! I read an article this week with a headline along the lines of "Canadians are panicking about food prices!" (If there were Canadians panicking, I was not one of them. Other than cauliflower I had not noticed any particularly unusual vegetable pricing. See this Toronto Star article for a less excitable example -- "Soaring Cauliflower Prices Come To A Head For Restauranteurs". The headline writers at the Toronto Star are definitely better at that job than I am.) Although there are some nuggets of truth in articles about rising Canadian food prices, they do not present a problem for policymakers. 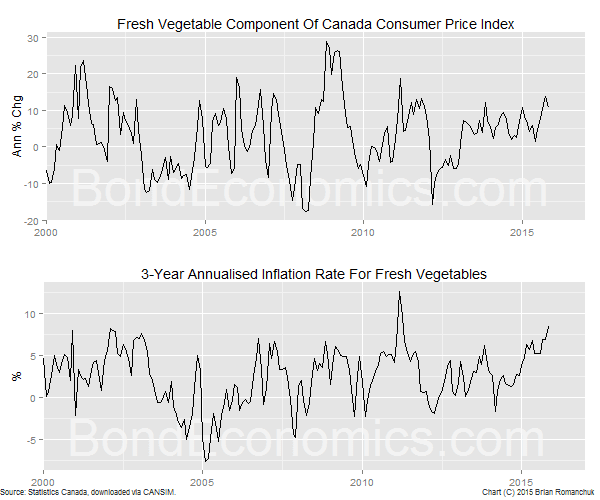 The data from Statistics Canada bear out that fresh vegetable prices are rising; the latest available data is for November, and the annual inflation rate for that component was 10.9% (chart above, top panel). That's a fairly scary level of inflation, but as the chart shows, such a high level of inflation is common for that component. (This is why some economists love to pick statistics out of the air without providing a chart; stripping numbers out of context makes them sound scarier than they are.) 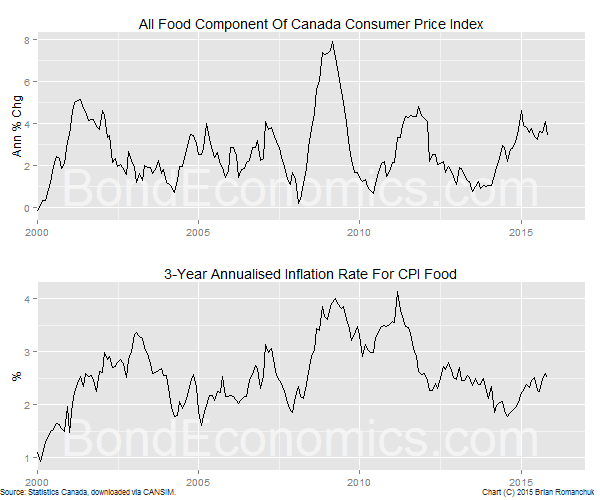 However, the bottom panel shows the annualised inflation rate over a 3-year window, and the inflation rate for this component has been running well above the Bank of Canada's 2% inflation target. The chart above illustrates why the jump of fresh vegetable prices does not pose a particular problem for policy. The aggregate of all food components of the CPI has been much less affected by the drop in the Canadian dollar, running at a 3.4% annual inflation rate in November. By comparison, the Canadian dollar was depreciating at a 17% annual rate in November. Given that divergence, it is clear that it would be difficult to have any confidence in estimates of the sensitivity of food prices to the value of the currency. 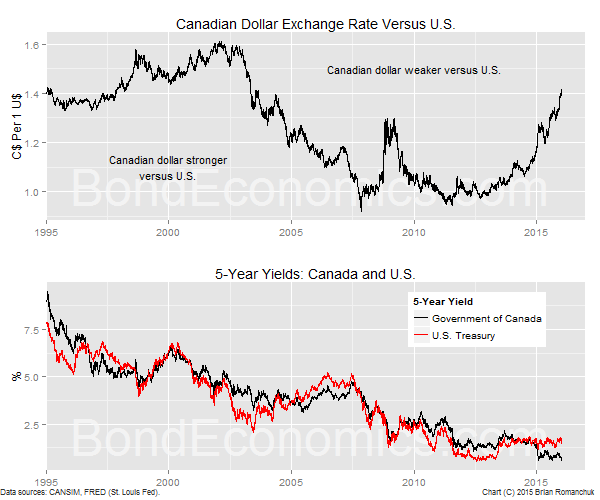 Admittedly, some of the stability reflects the fact that Canadian importers probably undertake currency hedging programmes; even if the Canadian dollar stabilises, some price rises will still filter through the pipeline. Nevertheless, the Canadian dollar is not going to keep falling at its current pace for years; it will eventually bounce back, and there will be a corresponding reversal in food price inflation. Moreover, Food is probably the component of the CPI that is most exposed to the currency. As a result, the aggregate CPI probably ends up with a very small sensitivity to the Canadian dollar. (We would probably need to strip out the energy component for such a sensitivity analysis; the value of the Canadian dollar is itself related to the price of oil.) Given this low sensitivity, policy makers are largely free to not worry about the value of the currency with regards to hitting their inflation target; the currency only really matters to what extent it affects the prospects for international trade. And this is despite the fact that the Canadian dollar is not a "reserve currency." As to explain the lack of currency sensitivity, I discussed food inflation in an earlier article. Like other developed countries, food expenditures in Canada are dominated by spending on restaurants and processed food, and prices for such food are dependent upon the cost of labour. (In general, those prices have inflated at a faster rate than less processed foods, which is a consequence of rising incomes.) This is a different situation than is the case for many developing countries; those countries were pushed into producing "cash crops," and they unfortunately import cereals. Furthermore, their diets feature much less processed food. This may be healthier, but this leaves food prices much more exposed to the price of raw foods, Correspondingly, policymakers in such countries do not have the luxury of ignoring food prices. Canadian yields have hit levels that I always had assumed were reserved for JGBs and perhaps Swiss debt. Since I doubt that the Bank of Canada would resort to negative rates (since the weaker dollar is doing the stimulus work for them), I assume that there is not a whole lot of room left for the secular bond bull market. That said, I doubt that there will be a significant reversal until there is a sign that the global economy is entering a sustained growth phase (and that the Canadian housing market is not weakening). If you are willing to expand on your comment that one should look to alternative markets as a means by which to deal with a turn in CAD, I would be very grateful. I have had a large natural short CAD in my portfolio for about 5 years, and I am happy for this; however, I was also short CAD when it last tore up 55%, and I don't wish to repeat the pain of that experience. But, like you, I don't believe I can forecast a turn, and I cannot afford to be 100% CAD. It's a big dilemma for me. What I was referring was the fixed income analogy to currency long/shorts: long/short duration calls. You can put on relative value trades (slope, butterfly) that are "directional": generally will move in the same direction as rates, but have a better risk profile. (That is, if rates keep moving in their current direction, the relative value trade will not move too much against you because what you are trading is already extended). Within currencies themselves, about the only way to do this is with options. However, you will see that implied vol is high, and so options are expensive. This leads people into trading exotic derivatives, which seems even crazier than most modern investment activities. I am now a retail investor, and about the only strategy I could conceivably implement is to buy Canadian equities that will benefit from a weaker currency, and outside the commodity sector. This has obvious drawbacks in the current environment. I realize now that the equity idea would not benefit from a turnaround in the currency; I responded too quickly and my brain was frozen into thinking about positioning for a weaker CAD (oops). For a stronger CAD, some cheap Canadian equities that somehow avoid the carnage in the oil sector, but are not exporters. Something like a telecom. The leverage to the currency would be via the market value translation (for a non-Canadian). For a Canadian, you can bring foreign equity positions back to Canada. Needless to say, I have no good stocks to recommend. I gave up trying to pick stocks a long time ago; I just look at broad index ETFs, which will be less useful for trying to position for useful correlations. Great comment till the end. If there is a serious slowdown in the U.S.economy in the second half (stock market is signaling this) and if the fed decides to stay the course and raise rates and wreak havoc in emerging markets, then the global economy is cooked and negative interest rates will be coming to Canada no matter how low the loonie goes in the short term. My 2 cents. Added a link to this in my latest on why the Bank of Canada should ignore bank economists and stay the course (and cut the rate again tomorrow). Negative rates are a sign of desperation. With the currency ripping downward already, why pile on? We also do not know how big a fiscal stimulus would be in the pipeline if things go south; even the Conservatives signed on to a stimulus package last time. If the currency started falling faster, we would have troglodytes screaming about the "Canadian Peso" and the need to *hike* rates. The only reason to cut rates further is if the currency stabilizes and the global economy goes in the tank. It could happen, but that's a combination that is not looking too likely right now. "The only reason to cut rates further is if the currency stabilizes and the global economy goes in the tank. It could happen, but that's a combination that is not looking too likely right now." Bingo! Not looking likely right now doesn't mean much when stocks continue to sell off viciously in an environment ripe for deflation. I know you like discussing deflation, but I only use that term strictly in reference to broad price or wage indices. On those measures, we are nowhere near deflation in Canada and the U.S. Sure, oil and risk asset prices are falling, but people buying $7 cauliflower heads are not seeing a lot of deflation. This cuts both ways; I don't scream about "inflation" when gasoline prices rise 10 cents. If you look at Japan, which is allegedly the poster child for deflation, the broad price indices largely went sideways, and had almost no outright declines. The United States had a massive shock to final demand in 2008-9, and inflation rates were stable at a low level; I doubt that the Canadian experience would be any different even if our housing market cracks up.